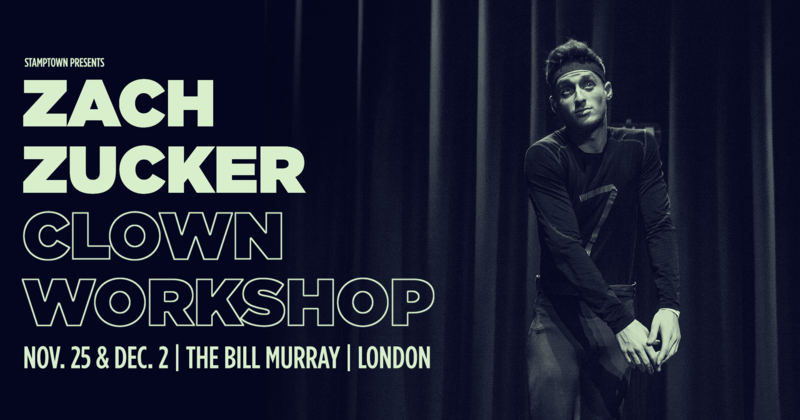 Award-winning, internationally-acclaimed performer Zach Zucker returns to London for a clown workshop focusing on finding your fun, listening to the audience, and exploring how you're loved onstage. This is a 2-day workshop taking place on Sunday the 25th of November and Sunday the 2nd of December. Award-winning, internationally-acclaimed performer Zach Zucker returns to London for a two-day clown workshop! This class focuses on finding your fun, listening to the audience, identifying and addressing bad habits, exploring how you're loved and becoming an overall more exciting, dynamic performer. Often times we enter with such strong ideas that we forget about the most important thing in the room - the audience. We either go too fast without letting them join in or we do too much and scare them off. But if you let them, they'll tell you exactly what to do. In this workshop we focus on reading the room by slowing down and unpacking every moment, listening for the laughs to tell us where to go. ZACH ZUCKER: A graduate of Ècole Philppe Gaulier in France, Zach is an award-winning performer and producer that tours original music comedy shows worldwide. His double act Zach & Viggo has sold out runs at Edinburgh Fringe, Soho Theatre and Melbourne International Comedy Festival, while his solo show Human Person has been nominated for multiple awards and sold out shows in LA, Berlin and New York. He is the creator of the independent music and comedy label Stamptown and has taught workshops at The Groundlings, UCB and Second City.